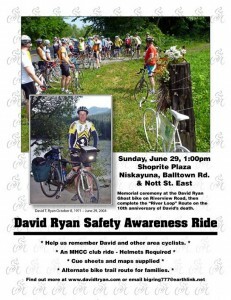 The David Ryan Safety Awareness ride marks the 10th anniversary of the collision that took Ryan’s life. David was a GRC physicist who worked in the area of super-conducting magnets. Originally from England and schooled at Oxford, he was an avid recreational cyclist and outdoor enthusiast who had a bright future ahead of him. 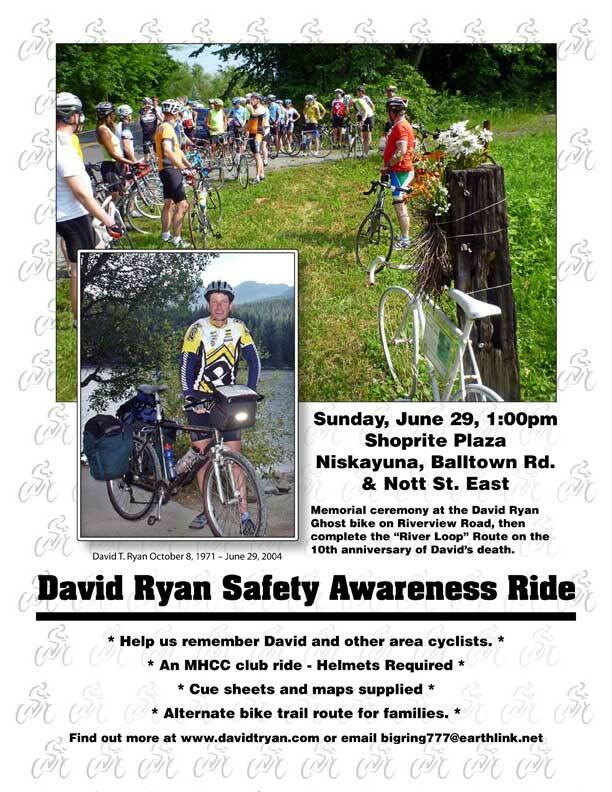 On June 29, 2004, while riding his usual training route on the scenic “river loop” through Colonie, Latham, Niskayuna, and Clifton Park, he was struck and killed on River Road just east of the Sugar Hill Road intersection. The river loop is a familiar route to many local cyclists who use it for training and recreation. The driver who struck Ryan was charged, pled guilty to one count of negligent homicide, and served a 1-3 year prison sentence.